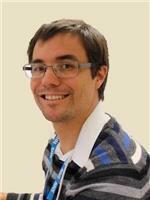 Dr Graham Grove, Medical Co-Director, Earl Mountbatten Hospice, Isle of Wight, UK, explains the background to a longer case report published in the May/June edition of the European Journal of Palliative Care. When I was a medical registrar, I had a pretty restricted understanding of the role of the doctor in palliative care, mostly limiting it to the prescription of opioids for suffering patients at the end of their lives. However, chance had it that one day I was called up to help out for the day on a palliative care ward. That day I rapidly discovered that palliative medicine was much more than blindly prescribing medications for pain and nausea. A crucial aspect of palliative medicine was, I realized, correctly diagnosing the pathology of a symptom – a good palliative care doctor needed to be a good diagnostician! And so, when nearly a decade ago, I read in the newspaper about a new generation of ultrasound that could be carried around your neck like a stethoscope, I decided it was time for me to learn how to perform and interpret point-of-care ultrasound (POCUS), just like thousands of Emergency Medicine and Intensive Care registrars had done before me. Is a patient’s uncomfortable swollen abdomen due to ascites, and is there a large pocket that can be easily and safely drained? Does the patient who is vomiting and constipated with peritoneal metastases have loops of dilated small bowel suggesting an obstruction and so might he/she benefit from octreotide and steroids? Does this patient with a vague headache and nausea have dilated optic discs to help guide me towards ordering a CT scan to look for cerebral metastases, when perhaps otherwise I would have watched and waited? Although my clinical judgement was that a patient with mild bilateral leg swelling didn’t have a DVT, should I rethink my diagnosis because when I ‘ultrasounded’ his femoral vein I was unable to compress it? Do I need to arrange an urgent urological review for a patient with acute renal failure because I can see hydronephrosis on a quick scan? Over the years, I’ve become increasingly amazed at the sort of things an ultrasound, carried by a clinician, can be used to look for. Of course, it could never replace formal imaging by a radiologist, but portable ultrasound use by the treating clinician adds enormously to the doctor’s diagnostic confidence and this can make big differences to treatment decisions, and therefore to symptom control. Given the advantage of point-of-care ultrasound, especially given that it can be done on the ward, in the outpatient clinic and in a patient’s home, I wonder if it is time to consider making this a formal part of every palliative care registrar’s training! This post relates to a longer article, ‘Case report: point-of-care ultrasound influencing treatment in palliative care’, by Graham Grove and David Holden, is published in the May/June 2016 edition of the European Journal of Palliative Care (vol. 23.3). 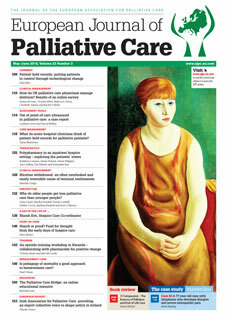 This entry was posted in EAPC-LINKED JOURNALS, European Journal of Palliative Care, SYMPTOM CONTROL and tagged Point of care ultrasound and palliative care. Bookmark the permalink.